PHILADELPHIA -- In a surprise development, the city's top prosecutor pleaded guilty Thursday to a corruption charge, resigned from office and was sent immediately to jail by a judge who said he couldn't be trusted. 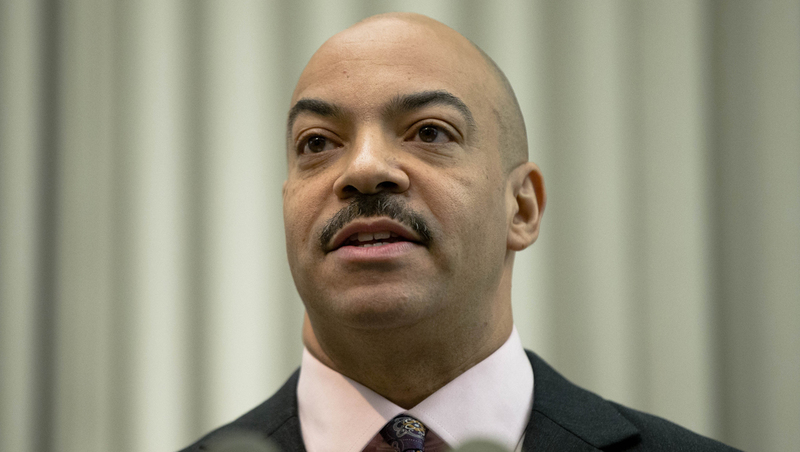 Two weeks into his federal trial, District Attorney Seth Williams pleaded guilty to the first count in a 29-count indictment of corruption, bribery and fraud charges, CBS Philadelphia reports. The rest of the charges were dismissed. "I'm very sorry," Williams told the court, choking up as he acknowledged he would resign. U.S. District Judge Paul Diamond said he was not inclined to trust Williams' assurances about appearing for sentencing set for Oct. 24, so ordered him immediately jailed. He was led out of the courtroom in handcuffs. Diamond said he was appalled by the evidence he heard during the jury trial, and had concluded Williams "sold" his office. Williams faces up to five years in prison. The move came after weeks of damaging testimony against Williams, a two-term Democrat who didn't run for re-election this year. The 50-year-old Williams was accused of illegally accepting gifts from two businessmen in exchange for legal favors. He was also charged with fraudulently using thousands of dollars from his campaign fund for personal expenses, misusing city vehicles and misappropriating money intended to fund his mother's nursing home care. He had been charged with 29 counts of bribery, extortion and fraud. Although 28 counts were dismissed, a prosecutor said in court that Williams admits he committed all the conduct, Philly.com reported. Williams, a graduate of Georgetown Law School, was the city's first black district attorney. Although he had remained in office after being indicted, his law license was suspended and a deputy was put in charge. Last year, before he was indicted, he belatedly filed financial disclosure reports showing he had accepted about $175,000 in cash, gift and trips from friends as he struggled to maintain his family's lifestyle after a divorce. He was fined $62,000 by the city ethics board, its largest fine ever.